While the boat was nowhere near as shiny as many of the other equipment on the Solent, It was clear that we had the opportunity to put the Phoenix to good use! It was very hands on, and we enjoyed and withstood all the weather had to offer – including a first night, late night traverse up the Bewley River, and truly tropical rain at Bembridge. My personal pleasure was being asked to (and succeeding) in laying out and navigating a course to circumnavigate the Isle of Wight! starting at Yarmouth, and finishing at Benbridge (clearing the entry bar by about minus 6 inches!) – it was GREAT fun and very satisfying! You can see my sketchy notes above, and once I had managed to translate the scale on the map to real life – (overrunning my first waymark within 2 minutes!) We were off – and while Duncan insisted we experienced no more than a 4 – later experience on Moody B included a “force 6” that was considerably calmer than our rounding of the needles – a really good day’s sailing! On the other side my biggest failure was successfully “lassooing” a bouy, but forgetting to hold on to the damn rope! Ejit! 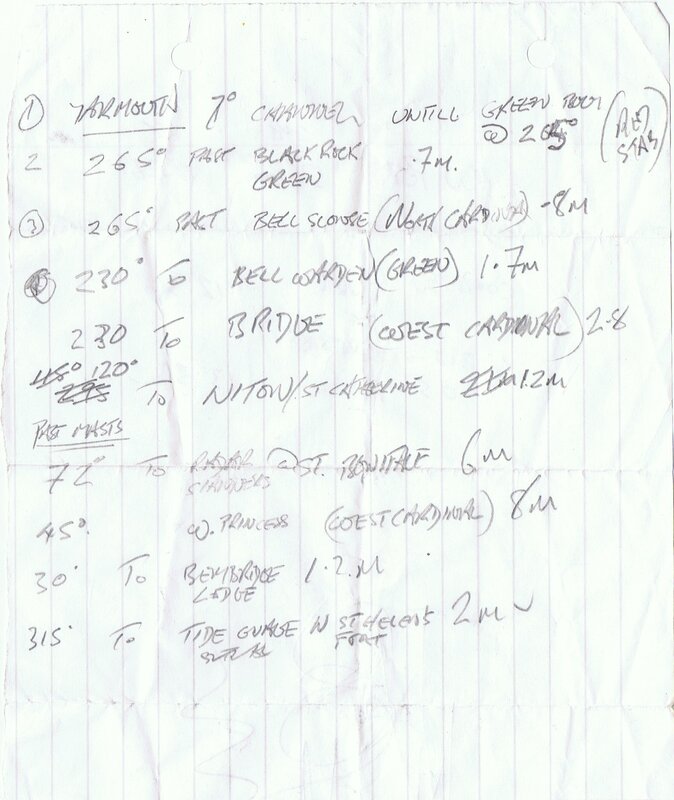 This entry was posted in The Sailing Log and tagged navigation, southern sailing school on November 7, 2011 by sybefur.